Piazza Cavour, via Duomo, via dell'Anticaglia, via Tribunali, piazza dei Girolamini, piazza S. Gaetano, via S. Gregorio Armeno, piazzetta della Pietrasanta, piazza Miraglia, via S. Pietro a Maiella, piazza Bellini, via S. Sebastiano, via Benedetto Croce, piazza S. Domenico Maggiore, piazzetta Nilo, via S. Biagio dei Librai, piazzetta Crocelle ai Mannesi, via Vicaria Vecchia, via Forcella, piazza Calenda. The route begins in ancient Piazza Cavour: here were found some parts of the fourth century BC Greek Walls C., who, only other archaeological evidence found on the hill of S. Aniello (just in front) have made possible the location, on its top, the area of the acropolis of the Greek city. Today the area is occupied mostly by university complex of the First Hospital, and is accessed from Port St. Gennaro. 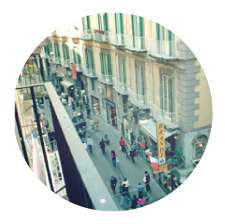 From Piazza Cavour, you get into via Duomo, artery crowded and lively, full of beautiful shops of textiles and clothing, pastries and coffee. You follow the road until you reach via dell'Anticaglia, named for the ruins of the ancient Theater of Naples greek-Roman historian Bartolomeo Capasso speaks thus: "For me and for those who love the patriotic glories, those walls are sacred: I look at them with religious veneration. Passing under the low strings of those times, my imagination through the centuries and, like magic, is transported to ancient times. It rebuilds the demolished theater, in which Claudius himself portrayed his comedy, and wanted to give Nero essay of his voice and his musical art. reconstruct the forum, the baths, the gymnasium of the temples, the porticos, the walls: the entire ancient city, in short, presents itself as a view my memory. " Cinquesanti an alley in the adjacent building houses a portal that seems to have been obtained with material stripped of Roman structures and therefore popularly called "Palace of Nero." Along the way dell'Anticaglia, we find the two Baroque churches of Regina Coeli and S. Mary of Jerusalem or the thirty-three. Returning to Via Duomo leave the path left Donnaregina with the Church of St. Donna Regina Vecchia and S. Donna Regina Nuova arriving at the cathedral, located on the left in a clearing surrounded by arcades. Inside the cathedral has been merged with the early Christian basilica with three naves of S. Restituta, today became the Cathedral Chapel. S. Restituta was the first Cathedral of Naples, founded by Emperor Constantine over a pagan temple, probably dedicated to Apollo. The original structure dates back to early Christian IV sec. and was dedicated to the Savior, the name of S. Restituta was given to the Cathedral in the ninth century. When we were brought the remains of the martyr in Africa. At the end of the fifth century. d.C. I was joined by a second Cathedral, Shrine East, called Stephanie, named after the founder of Stephen Bishop and that, in the tenth century, was also known as San Gennaro. The chapel has a plant in a Christian church, remarkable wooden drapery that opens on the arrival of the body of S. Restituta Ischia, by Luca Giordano, the Neapolitan painter of the '600. At the bottom of the right aisle we find the Baptistery of S. John Fonte. Built by Bishop Severus between 363 and 409 AD, is the oldest Early Christian baptistery in the western world. Has a square plan and is developed with a drum that supports the octagonal cupola. The beautiful mosaics evident in time, the predominantly blue color, are before the Byzantine influence. The few remaining mosaic floor suggest the preciousness of the invoice. The middle a tub immersion showing use of the early Christians to celebrate the baptism as adults, around Easter time. A ladder, beyond the chapel, leading to the archaeological area, with exhibits ranging from the Greek to the High Middle Ages: a column and the remains of an early Christian environment, environments Romans in "opus reticulatum", a street with traces of wagon wheels . Besides the Greek street, you come to another level of fine mosaic floor with the remains of perhaps the floor of the basilica Stefania. We cross the traffic lights just ahead and we are also being Tribunals (decumanus maior of Naples Greek). The first square on the left is the Piazza dei Girolamini where we find the two churches of Santa Maria della Colonna and Girolamini or S. Philip Blacks. Inside of that are the magnificent fresco by Luca Giordano expulsion of defiling the Temple (1684) and the beautiful Santa Maria Maddalena dei Pazzi, as well as in the transept, paintings by Solimena and Tracausano, Neapolitan artists of the seventeenth century . Reach Piazza S. Gaetano, center of the ancient Neapolis, the Greek Agora and the Forum in Roman times. Here you can see the statue of St. Gaetano of 1737, erected in memory of the plague of 1656, while on the right, on a staircase with two flights, is the Church of St. Paolo Maggiore, built between 1583 and 1603 in the Roman temple of Castor; preserves architraved columns on the facade and other fragmentary remains of inscriptions or columns of the Roman era. Next to the Church of St. Paolo Maggiore is one of the entrances to the Naples underground. On the left of the same square, in a recess, is the Basilica of St. Lorenzo Maggiore, one of the most important churches in Naples in the Middle Ages, therefore, a source of exceptional importance to historical knowledge. Indeed the excavations, which is accessed by a passage in the bottom of the cloister, have revealed interesting archaeological remains show the different layers Greek, Roman and medieval. It 'was during the work undertaken in 1954 for the restoration of the Church of Anjou, which have been identified parts of the structures of the existing church of the fifth century. d.C. with polychrome mosaics. Continuing research has been found that linked one of cardines current Via San Biagio dei booksellers and via the Courts, and the remains of Roman buildings in "opus reticulatum and opus latericium", which in turn rested on the ruins of the Greek. Archaeological excavations - very useful for information about the stratification of the city from Greek facilities to the Dark Ages - are still ongoing. Has been largely murazione a Greek of the fifth century BC, a vast Roman building of the first or second century AD that housed the public treasury (aerarium) along with many shops (a dyer, a potter and a baker) and, finally, the site of a "seat on the popular" Duke's era (eighth century AD). The discoveries made testify to the richness, liveliness and a considerable extension of Greek and Roman cities, making assume that further research may lead to further discoveries of fundamental importance. Piazza S. Gaetano goes by courts to the left and find the Chiesa di S. Mary of Souls in Purgatory or Purgatory in Arco. Front of the facade of the church there are four large pillars with skulls and femurs of bronze, on which the Neapolitans always most devoted lay flowers. At the end of the square of the way courts are Pietrasanta, where stands the Bell Tower of Pietrasanta, VI sec., The only surviving element of early Christian Romanesque to the Baroque reconstruction of the Church of St. Maria Maggiore. The rectangular base of the bell tower you can see fragments of friezes from Roman temples, while the top note is a mullioned window in a brick arch and the tower bell that ends in a cusp. Continuing to meet the right the Renaissance Chapel Bridge, and, later, in Piazza Miraglia, the Church of the Cross of Lucca and the entire hospital. It goes by S. Pietro a Maiella where you can find the homonymous church and the Conservatory of Music, one of the most famous of Italy. Facing the Piazza Bellini Conservatory opens with a central statue of the famous composer 800 and ruins of the ancient Greek walls of Neapolis in the fourth century. a. C.. Taking the road down the right and left of the arc Port'Alba, you get into via S. Sebastian, known for musical instrument shops, follow it all and you reach the intersection with Via Benedetto Croce on the right you can notice the monumental complex of S. Clare, on the left, but you proceed in Via Benedetto Croce, in honor of the Neapolitan philosopher who, in the historic Palazzo Filomarino fourteenth century at number 12, lived and died (1866-1952). This road is full of historical buildings and elegant shops of goldsmiths and handicraft sacred, and is animated by a constant coming and going, cheerful and noisy. At the end of Via Benedetto Croce is the characteristic Piazza S. Domenico Maggiore, in whose center stands the Spire of S. Dominic, this square was the limit of the greek-roman walls in the west (IV century BC.). At the top you open the secondary entrance of the Basilica of St. Domenico Maggiore, while on each side of the square you can see beautiful buildings ranging from the medieval to the '600 and '700 (Petrucci, Casacalenda, Corigliano and Sangro Sansevero). Moreover for the road at the top of the square - Via Francesco De Sanctis - you can visit the Chapel Sansevero particular, together with the Palazzo Sangro, famous for its sculptural virtuosity that preserves (including the famous "Veiled Christ" by G. Sammartino) and the eclectic personality of the Prince di Sangro, which you can see the "scientific experiments" in the crypt. Returning to Piazza S. Domenico Maggiore is passed in the adjoining Piazzetta Nilo, where there is the Church of St. Angelo a Nilo, center, during the Roman Empire, the neighborhood of Alexandria, which is testimony to the presence of a statue of the Nile in the Piazzetta called "Largo Corpo di Napoli." Found without a head, this sculpture, is mistakenly believed to be a woman breastfeeding her many children. The bearded head is two centuries later, and now, although altered, mutilated and restored over the centuries, the statue makes a fine show full of himself in a corner to the left at Via San Biagio dei Booksellers. Via S. Biagio dei Booksellers' decumanus inferior "of the Greek city, commonly referred to as" Spaccanapoli ", has along its course many churches, including the church of S. Nicola a Nilo, now desecrated, whose base is occupied by a dealer of used, and the church of Saints Philip and James. Typical shops sacred, antiques and jewelry make this route very characteristic. There are also interesting Renaissance palaces (Carafa Santangelo, Marigliano). Past the Chapel of the Monte di Pieta, located on the left, shortly after the Piazzetta S. Gregorio Armeno, where there is the homonym church, built probably on the spot where stood the Roman temple of Demeter, which would be part of the remains of the wall "opus reticulatum" on the south side of the church. Via S. Gregorio Armeno is the center of the manufacturers of cribs for pastors since 1700, and over the Christmas period, already from early November, is a must for fans craft Neapolitan crib. Almost at the end of Via S. Biagio dei Booksellers is located on the right side, a special craft workshop of restoration called "Hospital of the dolls. Returning to Via Duomo, are facing the square to Crocelle Mannes, where you can admire the apse incorporated in the early Christian Church St. Giorgio Maggiore, and in the street adjacent to the alley Carminiello Mannes, the remains of a Roman residential complex with attached baths. At this point we introduce the famous "fork" or vicariously old at the end of which was the "Gateway Furcellensis" (so named for the fork in the road similar to a fork), and reach the square where Calenda are other remnants of Greek walls. The Square is best known as a square Trianon. That concludes the path of the "ancient Naples. Among the maze of alleys that we passed, we heard the throbbing heart of the city: one that preserves the voices of street vendors, in the vivacity of the people in the chaos that surprises and fascinates the tourists, the memory of ancient Greek and Roman roots.